The corrections take place due to the Light that comes from the teacher. The corruptions come from the environment, from the group. But only if a person tries to be incorporated in the environment, taking part in its life and work, studying and being dedicated to the cause, is he sent corrupt desires. These special corruptions are not only foolish pride or other primitive desires, but corruptions that can draw the Light of correction upon them. This means that a person has to have defects that are totally opposite from the corrected form. He receives all these desires from the environment. We are speaking about a person who tries to do everything that he can in order to advance spiritually. Then he receives “red light” (redness) from the group, like from a mother’s womb. The group is a mother for him. He receives the “white light” (whiteness) from the father, from the teacher, and this whiteness is his Sefirot, his attributes. Now a person already has two lines and he has to work in the “middle line.” It isn’t that he can receive it automatically without doing anything. A person has to make efforts in order to be incorporated in this kind of work. Then to the extent that he annuls himself before the group, the teacher, the study, and the Creator, all these factors begin to operate on him and he attains a new level. Question: In what way is Hanukkah, which is related to the date of the Maccabee’s victory over the Greeks relevant today? What is its symbolic meaning? Answer: This holiday symbolizes the fact that eventually unity wins. This is the reason that the Maccabees won, and we have to act in the same way. The meaning of the holiday is very simple: If the people of Israel unite and draw the Light, they win. It isn’t by force. All the evil forces cannot be beaten but only by unity, although many are close to this approach. In essence, this is our message in mutual guarantee, but it leaves out one key factor. After all, our enemies are also united and even more so than we are. In fact, Israel can win only if its unity draws the Light. Then through Israel it is passed on to the enemies and changes them from enemies to supporters. This is the real victory. Thus the war takes place on a totally different dimension. We don’t operate external factors but rather nature’s internal forces and by that win the battle. Here we mustn’t forget that we are dealing with a force that holds all matter and suddenly begins to operate in an opposite way. The force of receiving, dominance, and cruelty rules our world. In our world, the strong take over others and use them to their advantage in their understanding and feelings, according to their own concepts. But there is a small, weak group, small and weak according to usual standards. 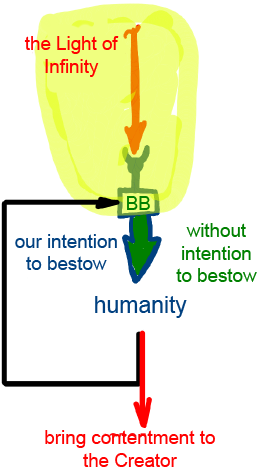 No one takes this group into account, although it can be like a magnifying glass and pass the Light through it—the great force of bestowal. This force will illuminate not the group itself, but its enemies, and then they will calm down, and be corrected; for example, they will suddenly feel that they have to deal with something else in a totally different place. The nations of the world think that Israel makes the world go round, and Israel really can do that—for the good of the world, of course. If it doesn’t do that, then it is bad for the world. So it turns out that the people of Israel always bring the world either good or bad. By that they have freewill: Like “switchmen,” they direct the Light of Ein Sof (Infinity) one way or another, determining by that its influence on the world and the form it will take. The question is whether we can dress this Light with the right intention of in order to bestow, or whether we don’t have the right intention. It depends on us, on the Bnei Baruch organization (BB). The Light drips, and we are with it—but are we holding on to the right intention? If we do, the Light that Reforms reaches everyone and the world is corrected. Then, of course, our enemies also disappear, or, in other words, the hostile desires and forces disappear. This happens if we are united, since then we give the Light the right attire of unity. If we are separated we don’t give the Light that goes through us the right “wrapping” and it turns into darkness for the world, to its opposite from. It is bad both for the world and for us, since humanity turns back to us, feeling that we are the source of all its troubles. This response will continue until we finally understand that there is no other way and that we have to correct ourselves to make ourselves and the whole world part of the Creator and to bring Him contentment. Question: Why, according to the whole historical process, does the rescue come as a result of big pressure, at the most difficult moment, after a long time that we were preventing ourselves from hearing about it? For what purpose are all these difficulties? Why is it required to reveal the Creator, the connection between us, in such torments and tension that we see ourselves at a dead end and only at the last moment, suddenly the answer is revealed? Why wouldn’t we all begin to occupy ourselves in the integral education, in the wisdom of Kabbalah, and walk comfortably toward the goal by having such a solution in hand? Answer: You know yourself that our ego is working as “help against us.” And only under tremendous pressure do we agree to separate from it. And also this is not immediately, but only after many blows— the ten plagues of Egypt, in darkness, under terrible tension, and in haste—are we finally willing to escape from it. Otherwise, no. And this is not because we are so weak, but because the ego is very strong. This ego helps us later to reveal the whole eternal spiritual world. Once we connect, we immediately begin to reveal and feel it. Right here in this life we reveal the upper world; about this it is said: “Your world you will see in your life.” I hope that we will reach it. If we will now perceive all this pressure as force that is given to us precisely as help, then we will see that it works on our side. One needs only to receive it in understanding and we will succeed.